Early flights were populated mostly with those emigrating from Ireland. SIXTY YEARS AGO today, Aer Lingus began flying across the Atlantic. The Aerlínte Éireann Lockheed L1049 Super Constellation aircraft embarked on its inaugural flight from Dublin and Shannon to New York with a crew of six tending to 99 guests in economy class. Today, Aer Lingus operates largely Airbus A330 aircraft crossing the Atlantic carrying as many as 317 guests on each flight. Early flights were populated mostly with those emigrating from Ireland and it is estimated that the airline carried close to 15,000 guests to and from New York in its first year. Flight time from Ireland to New York was then approximately 14 hours outbound and cruising altitude was between 16,000 and 18,000 feet making the journey more susceptible to turbulence. In 2018, the outbound flight duration of the ever-popular Dublin to JFK journey is almost halved at a scheduled 7hrs 30mins. 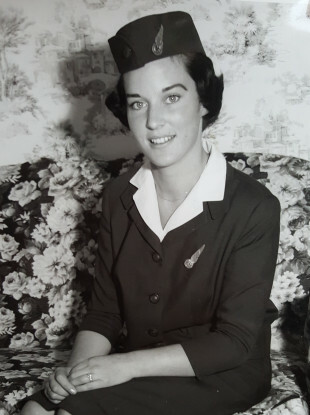 To celebrate the anniversary, the airline invited 79-year-old Lily O’Connell from Leopardstown in Dublin, who was a member of the Aer Lingus cabin from 1958 to 1962. Speaking to TheJournal.ie, Lily said that becoming a “hostess” was the only thing she wanted to do. It was what I wanted to do from the moment I arrived on the earth. It was all I wanted to do, so when I got the chance I applied and luckily got through and got the job. “When I was flying back then we would fly from Dublin to Shannon and pick up passengers at both airports and then fly to New York. I loved the passengers, everyone was just so friendly and lovely. There was great excitement in the air. I remember the Americans on board coming to ‘I-R-Land’, as they called it, they were so excited to be meeting their Irish family connections for the first time. For Irish people flying home – they had saved for months for the air fare as they were so expensive back then so it was just lovely on board, everyone was in great spirits. “My highlight was when I went to Maine in America as part of a publicity trip – I remember bringing part of a Christmas tree home to Shannon Airport which sounds a bit mad now – I think it was a gift or something. I was in the papers and I even was on TV in Maine – that was wonderful. Having flown on the 707 for two and a half years, Lily was impressed with its replacement. Taking to the skies in the 50s was all glamour for Lily, coming at a time when people very rarely flew, but it was an encounter with a passenger which saw her time in the skies end. Today, Aer Lingus’ Dublin Airport hub is a European transatlantic gateway and ranks as the fifth largest European airport for connectivity to North America. Email “'I lived for every flight' - Aer Lingus marks sixty years of transatlantic travel”. Feedback on “'I lived for every flight' - Aer Lingus marks sixty years of transatlantic travel”.